Spalding increased their lead at the top of the South Lincs & Border League to 18 points with a win over Boston 2nd, while challengers Sleaford 2nd went down to Woodhall Spa 2nd. In a low-scoring game at Spalding, Ben Troops and Warren Nel hit half centuries but 96 for Connor Parsons, supported by 55 from Danny Wells, took Woodhall to the division’s highest total of 280 before Sleaford were bowled out for 156. Skegness moved back up to third in a high-scoring win over Welby Cavaliers and Long Sutton moved up the table following their four wicket win over Grantham 2nd . Harry Adams hit 78 to give Belton Park victory over Timberland - for whom Simon Behan made 70 – and keep them at the top of Division One after second-placed Baston went down to Moulton Harrox. 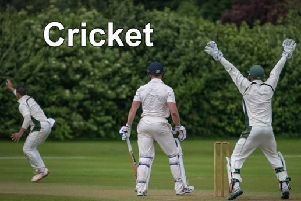 Liam Probert and Jamie Juckes both claimed five wickets in Spalding 2nd ’s victory over Heckington and there were six wickets for Lawson of Graves Park, who went down to Claypole, for whom Kristian Lennon took five. The only century of the day came at Uffington in Division Two where Alistair Pike hit 120 of his side’s total of 180, only to see Billingborough 2nd overtake this to win by six wickets. And Freiston 2nd beat Belton Park 2nd by seven wickets. Premier Division: Boston 2nd 109 (B. Troops 56) Spalding 112-2 (Nel 56); Welby Cavaliers 203-9, Skegness 205-2; Woodhall Spa 2nd 280 (Parsons 96, Wells 55), Sleaford 2nd 156; Grantham 176-9, Long Sutton 177-6 (Stanway 62no); Stamford Town conceded to Billingborough; Bourne 2nd conceded to Freiston. Division One: Belton Park 242-9 (Adams 78), Timberland 176 (Behan 70); Moulton Harrox 180-8 (Kearns 52), Baston 130; Spalding 2 nd 140 (Gill 66, Probert 5-45), Heckington 65 (Juckes 5-21); Claypole 191 (Lyon 50, Lawson 6-46), Graves Park 98 (Lennon 5-37). Division Two: Uffington 180 (Pike 120), Billingborough 2nd 181-4; Belton Park 2 nd 118, Freiston 2 nd 121-3.